Difference between revisions of "The Autocrat"
Delia created music for The Autocrat, an Arts & Education Feature for radio produced by Paul D'Andrea and directed by Michael Rolfe. The "entry date" for its tape is April 1971. 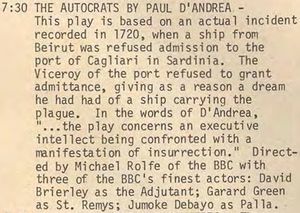 Though the tape catalogues and the programme listings all call it "The Autocrats", the programme director assures me that the correct title is "The Autocrat". as St. Remys; Jumoke Debayo as Palla. In the early to mid 70's, National Public Radio and the National Endowment for the Arts financed the production of a series of radio plays, some of which were purchased from the BBC. KRAB was a NPR affiliate at that time.” The radio drama series was called "Earplay" and it was distributed on LP. Nothing in the Radio Times listings matches this. Michael Rolfe is credited with producing some radio programmes for Schools in 1971-2, mostly Stories and Rhymes for 7-9 year olds, while David Brierly and Garard Green act in Rolfe's Orange-Coloured Holiday Show broadcast on 27 December 1971. Paul D'Andrea, the play's producer, says that the copyright is owned by him, not the BBC. Does not seem to have been broadcast by the BBC. Broadcast on KRAB.FM, Seattle on 28th April 1974 at 7:30pm. The current KRAB archivist has not found a copy but is asking around. but they do not include The Autocrats. The BBC Sound Archive's tape TRW 7379 is missing. ↑ 1.0 1.1 1.2 The Tape Library List's entry for TRW 7379. ↑ 2.0 2.1 Personal communication from Paul D'Andrea, September 2016. ↑ Personal communication from Paul D'Andrea, June 2017. ↑ 4.0 4.1 KRAB.FM's programme listing for April 1974. ↑ The 28th April 1974 was indeed a Sunday. ↑ KRAB.FM, personal communication, 26 May 2016. ↑ Search results for "Michael Rolfe" on the BBC Genome Project. ↑ Orange-Coloured Holiday Show on the BBC Genome Project. ↑ Personal communication from Chuck Reinsch, 26 May 2016. ↑ The OTRR Library catalogue was last checked on 26 May 2016.